Editor’s Note: United under the core principles of community vision, cost-effectiveness, collaboration, and citizen-led change, the approach that we call “Lighter, Quicker, Cheaper” goes by many names. “Action-planning,” “guerrilla urbanism,” “pop-up projects,” “city repair,” and “DIY urbanism” all have their followers, but perhaps none more so than “tactical urbanism,” including the authors of this article. At PPS, we see each of these efforts as important catalysts for larger community-based placemaking processes. 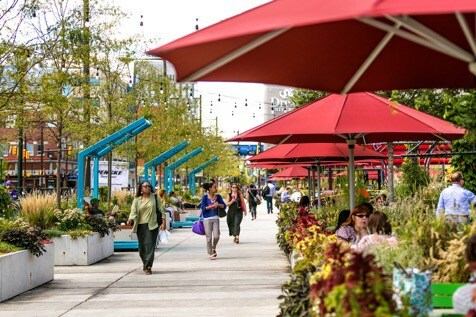 PPS has been collaborating closely with the University City District for the past 7 years, helping to support their Lighter Quicker Cheaper approach, to promote placemaking in their mission, and to advise on their 30th Street Porch Project. At Placemaking Week 2017 in Amsterdam, Nate Hommel and others led an intriguing session on how LQC interventions at street level are changing the way they do business in their city. University City District (UCD) is a special services district spanning 2.5 square miles of commercial, institutional, and residential neighborhoods in West Philadelphia. While the district was founded 20 years ago to provide public maintenance and safety services, its approach to community and economic development has expanded significantly over time to provide transportation services, host signature events, support neighborhood jobseekers and businesses, and to design, build, and maintain public spaces. 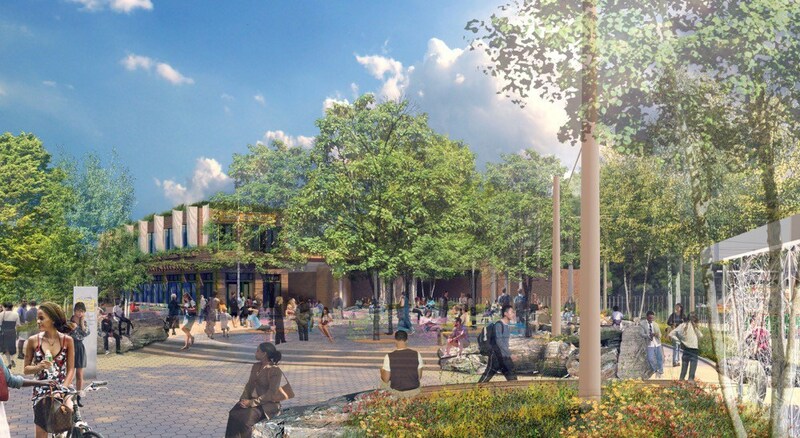 UCD conducts its public space work in the context of historically significant architecture and major public realm investments by the University of Pennsylvania and Drexel University, as well as a growing number of developers. The focus of our public space portfolio is working in the spaces in between and beyond the institutions in order to bring the public realm to a human scale. UCD often works with underused parcels that sat for decades—as parking lots, vacant space, or long stretches of concrete—and transforms them into welcoming public spaces. Many public spaces start with a formal plan, intensive build-outs and large upfront costs; in contrast, UCD starts with modest, removable interventions. The team uses tactical urbanism and placemaking techniques to build trust with users, neighbors, City officials, funders, and stakeholders. This allows UCD to be more experimental in long-underutilized places and has led to some of our most successful interventions. The internal motto is “perfect is the enemy of done.” Not waiting for perfection enables immediate progress and emboldens adjustments to our spaces based on data. 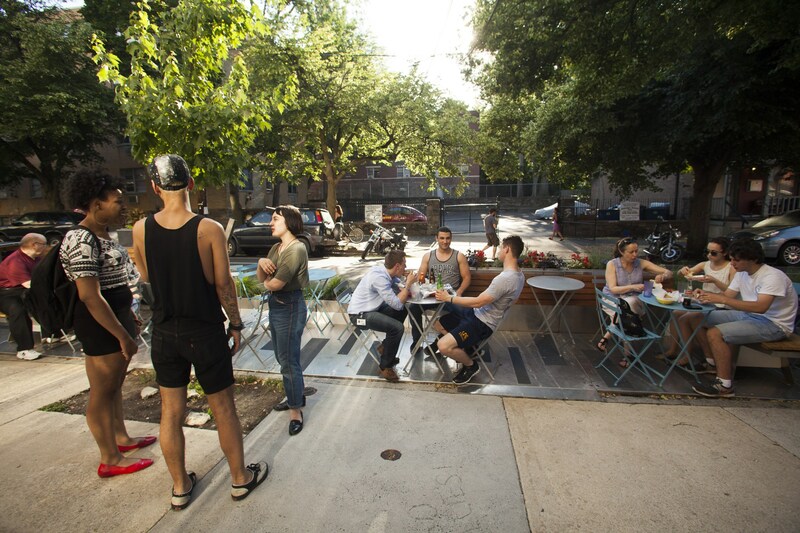 In 2011, we brought the first Parklets—innovative seating platforms—to Philadelphia (Hack). We started with two small Parklets and expanded to six throughout the community, adjusting the design based on user feedback (Tinker). We made them strong, durable, and flexible. 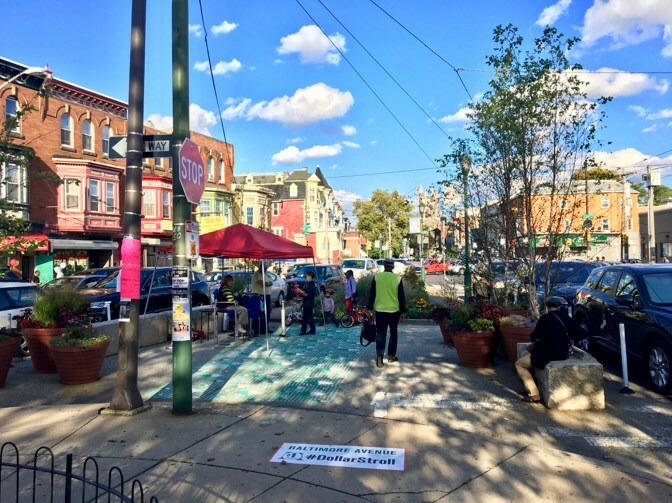 This built trust with neighbors, shop owners, and City officials such that within three years Parklets went from a UCD experiment to a program that the City runs in communities throughout Philadelphia. Our flagship space, The Porch at 30th Street Station, was formerly a 25,000 square foot parking lot located outside of iconic 30th Street Station, the third busiest Amtrak station in the country. 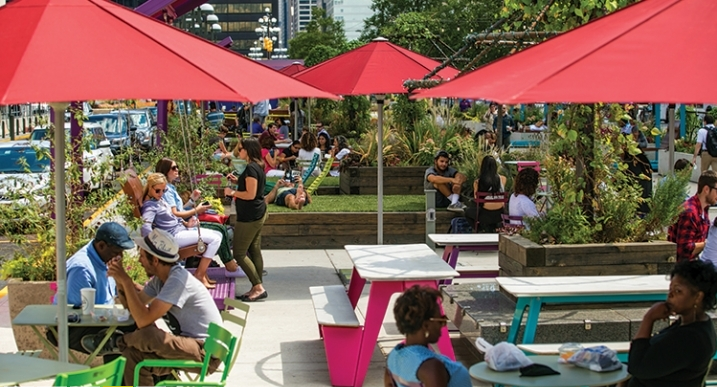 UCD wanted a vibrant way to welcome visitors to Philadelphia, so the first intervention was to introduce simple, moveable tables, chairs, umbrellas and raised planters to get in as many plants as possible onto a bridge structure. Dynamic programming drew people to the space and we studied user behavior in great detail: hourly visitor counts; their age and gender; and their activities, such as food consumption (from home vs. an onsite food truck), how long users sat, where they congregated, and more (Analyze). This data armed us with a deeper understanding of what visitors wanted from the space, leading us to Porch 2.0 in 2014 (Design). The second iteration included more seating options, more plants, more food, and more fun. We added 14 custom swings, enhancing the whimsical nature of The Porch, and have been amazed to see an average of 300 visitors a day enjoy this wonderful amenity. Since UCD didn’t have the funding to build everything in the first phase, iterative placemaking was fundamental to long term success; small changes built trust which opened up more funding for us to make the bigger changes. Each project allowed UCD to build credibility and become more experimental in its approach. In 2012, UCD began working on Pedestrian Plazas, simple spaces intended to reduce crossing distances for pedestrians and provide a pleasant resting place. Simply by adding planters, plants, large stones, and a little paint we were able to transform empty pieces of asphalt into vibrant sidewalk extensions. Like Parklets, Pedestrian Plazas started as a UCD experiment, and have since become a citywide program. All of these experiments have led us to The Trolley Portal Gardens, a $5mm project at the busiest at-grade rail station in Philadelphia. For decades, the space around this busy trolley hub was strictly utilitarian. Little about the space made people proud to use public transit, and we sought to add dignity to their daily experience. We wanted people to be proud that they took a trolley and to set an example of how a station could become a community amenity even for those who don’t use public transit. Based on the trust UCD had built over the years with community, City officials, funders and more, we were able to work closely with the Southeastern Pennsylvania Transit Agency (SEPTA), the City of Philadelphia, and neighborhood groups to create a park and multi-story restaurant/café called Trolley Portal Gardens. It has taken us nearly six years since project inception, but we are now in full-scale construction with hopes of a spring opening of the Trolley Car Diner restaurant, and beautiful public space. Everything UCD had learned from years of tactical urbanism and placemaking experiments contributed to this design: moveable tables and chairs, flexible spaces where impromptu gatherings or play could occur, and lots of plants. Best of all, Green City Works, UCD’s full service landscaping social venture, will maintain the space, ensuring that the neighborhood’s beautification is tied to growth and opportunity for local residents. UCD knows this isn’t going to be a perfect space, and will make adjustments as needed; it will never be afraid to make changes or admit mistakes. Because, once again, perfect is the enemy of done.